All of our furniture comes with a limited warranty on any manufacturing defects resulting from normal use. The duration of international warranties may differ from those in the USA and may vary from country to country. If not purchased in the USA, please contact your retailer for more information. All other terms of warranty remain the same as those for items purchased in the USA. Dream On Me provides a warranty against all defects in workmanship and materials resulting from manufacturing or shipping processes for 3 months, from the date of the original purchase. This warranty is limited to repairing or replacing any part of the product that, in Dream on Me’s opinion, is defective in materials or workmanship under normal use and service during the 3 month warranty period. During the warranty period, Dream on Me will repair or provide parts at no charge to you. This warranty is valid only for the original purchaser. This warranty does not cover damages or malfunctions caused by but not limited to normal wear and tear. Repairs or modifications made by an unauthorized 3rd party, failure to follow the instruction manual and improper operation or extreme use. Dream on Me warrants to you, the original buyer, that Dream on Me shall be free of all defects in workmanship and materials for 3 months, from the date of the original purchase. Dream on Me will repair or replace, in its discretion, all or a portion of the product that is defective. A full replacement of the product will only be provided if the product is unable to be repaired or if a replacement part does not correct the defect in the product. This warranty applies under condition of normal household use, but does not apply to damage or defects that result from negligence, misuse, abnormal use, accident, commercial use, normal wear and tear (including but not limited to burns, cuts, scratches, tears, scuffs, watermarks, indentations or pet damage), abuse, improper cleaning (including but not limited to the use of detergents, abrasives or other harsh cleaning agents), alteration to the finish, design or hardware of the product, improper handling after product is received or from exposure to weather is not covered by the warranty. Any product modification that is not authorized by Dream on Me will void this warranty. This limited warranty is non-transferable. THE FOREGOING WARRANTY CONSTITUTES DREAM ON ME PRODUCT’S ENTIRE OBLIGATION TO BUYER WITH RESPECT TO ANY DEFECTS IN THE PRODUCT. THIS WARRANTY IS IN LIEU OF ALL OTHER WARRANTIES, EXPRESS OR IMPLIED, INCLUDING THE IMPLIED WARRANTIES OF MERCHANTABILITY AND FITNESS FOR A PARTICULAR PURPOSE. 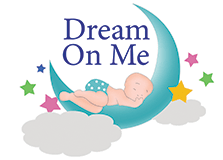 DREAM ON ME WILL NOT BE LIABLE FOR ANY SPECIAL, INCIDENTAL, CONSEQUENTIAL, OR INDIRECT DAMAGES, EVEN IF IT HAS REASON TO KNOW IN ADVANCE THAT THEY ARE POSSIBLE. To obtain service under this warranty, the original purchase receipt must be provided. This warranty shall be governed by the laws of the State of New Jersey and buyer agrees: (i) that any action to enforce or for breach of this warranty shall be venued exclusively in the state or federal courts located within the State of New Jersey; (ii) it consents to the jurisdiction of the state or federal courts located in the State of New Jersey and waives any defenses to forum non-conveniens or jurisdiction; and (iii) that any laws of any state pertaining to conflict of laws shall not apply.